I don't think anyone in Poland has ever heard of fried green tomatoes. For that matter, they are not very common outside of the US south. However, I made the world's best fried green tomatoes earlier today, and I want to share my tips and techniques. And, because the best tomatoes I've ever eaten (outside of those from my Dad's garden) were from roadside stands in Poland, I've decided to call my recipe Polskie Smażone Zielone Pomidory -- Polish Fried Green Tomatoes! So here's how I did it. First off, tomato selection is key. I much prefer green tomatoes that have the barest hint of pink to them. But use caution--if you buy them, you must use them the same day or refrigerate immediately--they will go from green to slightly pink to ripe in the blink of an eye. Why not totally green? I find that solid green tomatoes are just a bit too hard when cooked. When you get one that is just at the very earliest stages of ripening and fry it, you'll find the inside is a bit more tender and juicy. But caution, if really starting to turn, the inside will become mush. It's imperative that you get tomatoes with only the very slightest hint of a pink blush--trust me on this. Green Tomatoes, sliced thin and evenly, about 1/4 inch--no more! Once sliced, lay on some paper towels to dry them. First dry coat: Mix equal parts of masa harina (corn flour) and cornstarch. Add some cayenne (be generous, very generous) and salt. Mix well. Wet coat: Beat three eggs with a scant quarter cup of milk or buttermilk. Season with salt and pepper and add some tobasco. Then add more tobasco. Breading Coat: Take equal parts of masa harina (corn flour) and find ground cornmeal. Add about a third more fine bread crumbs. Add salt and cayenne. Add more cayenne. Trust me. Remoulade. You need a bit of topping or dipping sauce. My preferred sauce is a quarter cup of mayonnaise, a few tablespoons of sour cream, a tablespoon or two of ketchup, and a few tablespoons of horseradish. Mix well and let sit a bit. You can make it ahead (I usually make it first to give the flavors time to meld). Using the wet-hand/dry-hand method, first dip in the first coating. This makes them very dry so the wet coating sticks. Then dip in the wet coating. Finally, put in the breading coating. pack it on top, make sure it's completely covered. Gently lay in the hot, 350-degree oil. Fry about 2 minutes on the first side, then turn with a tongs and fry another minute or two until golden. Transfer to a wire rack that's been placed on some newspaper or paper towel--this allows any excess oil to wick away and keeps them from getting soggy or oily. Do not salt at this time, unless you've been stingy with the salt in all the other layers. If you were generous enough, they'll be perfect, trust me! Fry in small batches. You can keep warm in a warm oven. They really need to sit about 3-5 minutes before they're cool enough to eat. Now, plate and enjoy. You will be amazed at the great flavor--you'll taste the corn a bit. Now, as they say in Polish: Smacznego! Enjoy! Good Eats! 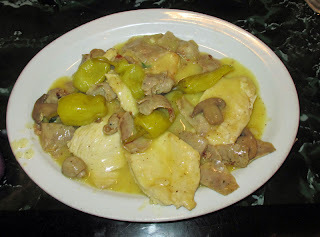 We decided to try Papa Tony's Italian Restaurant for dinner recently, and it was a good choice, the food and service were very good. Upon arrival we were promptly greeted and seated by the hostess whom, I assume, was "Mrs. Papa Tony." I noticed that she was busy taking care of lots of things during the course of our visit, but first and foremost greeting customers. I also noticed Papa Tony himself in the dining room on one occasion, greeting a few tables with people he seemed to know, though we did not meet him. Anyway, Papa Tony has quite a menu, so it took us some time to decide. But eventually Tommy and I decided and ordered. 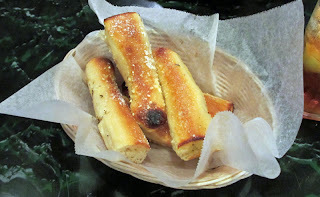 Both of us chose dinners, and each came with the Antipasto Bar and breadsticks. The Antipasto Bar was very nice. Besides the normal lettuce and dressings, there were some nice things like pasta salad with beans, artichoke hearts, etc. ; olives; carrots (quite yummy); and a lot of other typical fare. Everything was very fresh and very tasty, as were the warm breadsticks. A nice start to our meal. For his main dish, Tommy chose the Chicken Parmagiana served over spaghetti. It was very good, a nice and tender, juicy chicken breast was breaded and cooked, then topped with cheese. Finally, it was placed on the bed of spaghetti and doused in the house marinara. 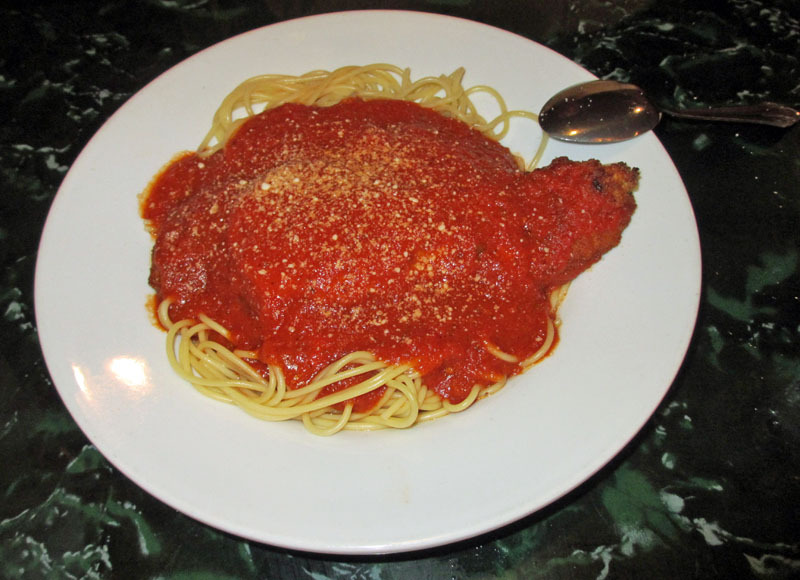 The marinara, I'm sure, is home made--it was very good, nice and fresh tasting, not too salty, with a hearty tomato flavor. The whole dish was very good and there was more than enough for one person to eat. You guessed it: doggy bag! Our service thorughout our meal was very attentive and friendly. The server knew the menu well and was able to answer all our questions as well as make suggestions--and our beverages were kept full, too. All in all, we had a very nice experience here. With so many Italian restaurants around, it is nice to find one that really pays attention to detail. I'd come back again, for sure! Finally open! This past Saturday I heard that The Breezeway Restaurant & Bar opened three days earlier, so I hurried over to give it a try. Considering it was their third day of business, I was impressed and I'll surely be back in the near future--likely time and time again! The Breezeway Restaurant and Bar opened in downtown Sanford in a wonderful space formerly home to the acclaimed Two Blondes and a Shrimp. Since that establishment closed about a year ago, several others have tried--briefly--and failed in this spot. This time, the new owners have put a lot of thought, effort, and money into the space. Newly remodelled with a new outside bar and a totally redone kitchen, this place has a lot of character and a lot of promise. We arrived around 5 on a warm Saturday afternoon and were promptly greeted and seated by the hostess. We chose to sit outside. Though it was a very warm afternoon, there was a nice breeze in the breezeway. Perfect! We spent a bit of time studying the menu and started off with drinks and appetizers. Our drinks were both very good. My friend Tommy had margarita type, and mine was raspberry flavored, served in a martini or gimlet glass. Both cold drinks hit the spot on a hot day. It took a while for our appetizers to arrive, and our waitress was quite apologetic for the delay. When they finally arrived, we had not plates or silver, but our waitress immediate spotted that and hurriedly recitifed the oversight. Like I said, this was their third day of business. 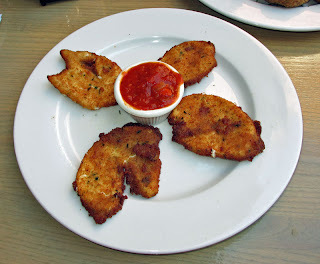 The best, by far, of the two was the Fried Mozzarella Cheese Wedges, house-made mozzarella that was sliced, breaded, and fried. It was served with an in-house made marinara. This was very good. The mozzarella was nice and creamy and warm. The marinara was also served warm and was a nice compliment to the creamy cheese. This was many steps about the normal "mozarella sticks" served by so many places. I'd put this in the top few as far as fried mozzarella goes, for sure. I would order this again next time, no doubt about that! We also ordered the Fried Mushrooms. Unfortunately, this turned out to be our least favorite dish. First of all, they lacked a bit of seasoning and did taste better when I put some salt on them. But to me it seemed that the kitchen messed up here and forgot to season them. 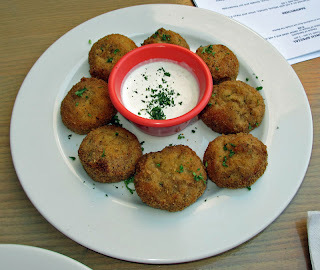 Secondly, they were just kind of plain, mushrooms with a breaded coating that were deep fried. They lacked some oomph! or something like that, they were just kind of plained, and underseasoned. On the other hand, the "dipping sauce," a horseradish sour cream sauce, was very good. It gave the bland mushrooms a bit of flavor. I'd have eaten a bowl of that sauce all by itself, it was that good. After the slowness of our appetizers, everything else really arrived in a very timely and quick fashion. 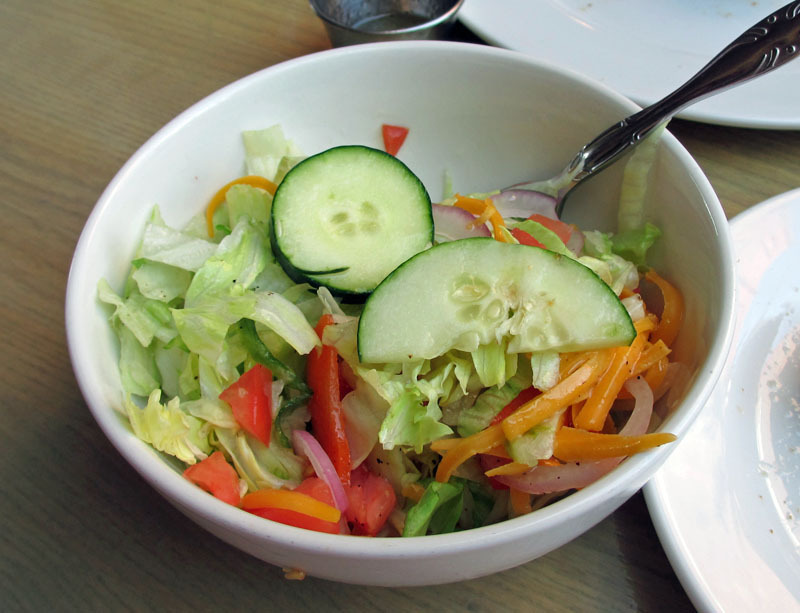 The salad I had with my sandwich was fairly ordinary, but very fresh, shredded iceberg lettuce with some onion, tomato, and cheddar cheese. The house Italian was nice and light too. For his main course, my friend Tommy ordered The BIG Fish, the signature sandwich. 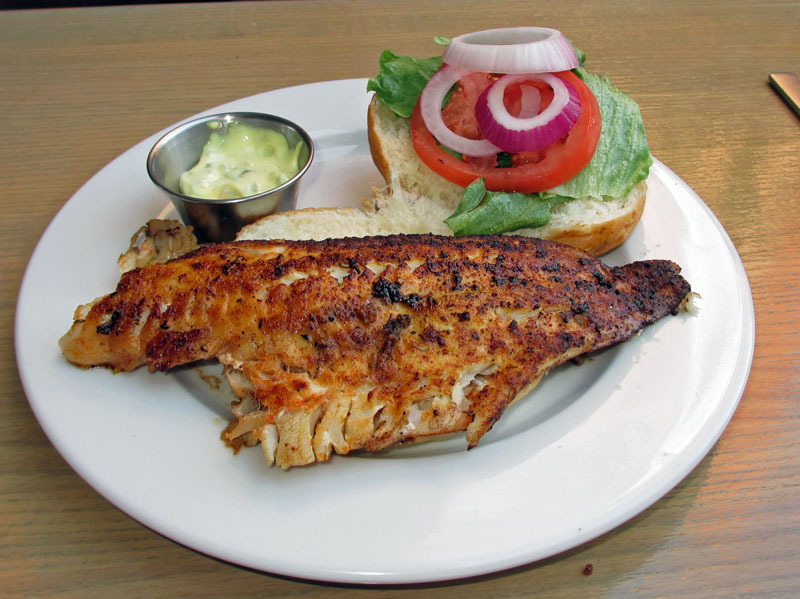 The Breezeway uses the tag line "home of the Big Fish" on their menu, and they were right. A nice sized piece of red snapper was nicely blackened and cooked and seasoned just right. It was served on a roll with lettuce, tomato, and onion. But the star of the dish was the fish, no doubt. One thing about the tartar sauce--it seemed to have a bit of curry in it, an unusual ingredient. Though I didn't mind it, Tommy was not a big fan and I think those who don't like curry may be put off by it. But overall, the fish was tender, moist and flavorful, and this was an excellent signature sandwish. When my dish arrived, I thought they brought the wrong thing. 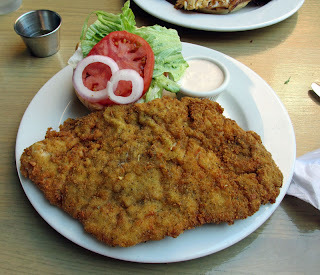 I ordered the "Sanford Special," a sandwich--this appeared to be a huge cutlet of some sort. Well, this was indeed my sandwich. Take a look at that! It was ginormous! More like a schnitzel, a pork tenderloin had been pounded, breaded, and fried. It was delicious and quite tender and juicy. It was served with a horseradish sauce which was also excellent. This was a great sandwich, though it made the bun look small. Nonetheless, though it was tough, I managed to finish it off--with just a bit of help. I would say this is a definite value and certainly would fill up even someone with a huge appetite. Overall, our experience here was very good, especially given that it was day three of their operation. I imagine that in time a few of the rougher edges--and they were minor--will be polished. If they keep it up, they show great promise and I'll be back time and time again. Good job to Steve and all the crew. Yumm!